The impact of research for implementation: a series of case studies. This is one of several case studies illustrating the scope and impact of “research for implementation.” These were originally published in the report, Bridging the gaps in malaria R&D: An analysis of funding—from basic research and product development to research for implementation. It summarized the findings of a pilot study comparing this field to funding for basic research and product development. More than one-third of all deaths in children younger than 5 years in Africa are due to malaria, pneumonia, or diarrhea. Fever is often a symptom of all three, so accurate diagnosis and the correct treatment are critical. However, diagnosis and treatment have not been provided consistently and properly. Integrated community case management of childhood diseases was recommended in 2012 by the World Health Organization and United Nations Children’s Fund as an essential health service for children who live in hard-to reach areas. 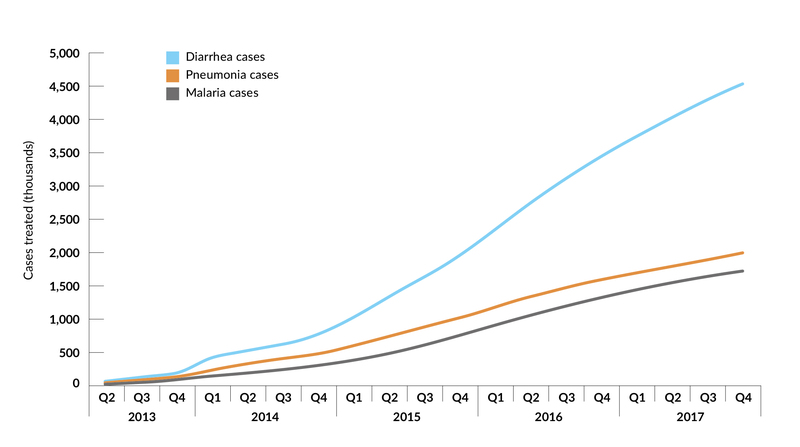 The Rapid Access Expansion Programme trained almost 8,500 community health workers in five sub-Saharan African countries to manage childhood cases of malaria, pneumonia, and diarrhea, and underlying conditions like malnutrition. Key elements of the program included recruitment of educated workers who lived in remote communities, worker training and regular supervision, sustained supply of high-quality medicines, and community support and engagement. More than 8.2 million children were diagnosed and treated for pneumonia, diarrhea, and malaria. Each country also updated its national policies to facilitate the scale-up of integrated community case management of childhood diseases. The Democratic Republic of the Congo, Niger, and Nigeria are planning to expand these programs nationally. The project was funded by the government of Canada and managed by the World Health Organization’s Global Malaria Programme between 2012 and 2017. Ministries of health of the Democratic Republic of the Congo, Malawi, Mozambique, Niger, and Nigeria were involved. Nongovernmental organizations supported the implementation. Panels of external experts provided strategic guidance and review. Nigeria has one of the highest mortality rates among children under 5 years of age in the world, at 109 deaths per 100,000 live births. Malaria, diarrhea, and pneumonia are among the leading causes, accounting for 40% of all child deaths in Nigeria. Diagnostic tools and treatments exist, but few children are treated appropriately. For example, just 18% of children diagnosed with malaria received the recommended treatment (ACTs). When a child has a fever, 34% of households seek treatment from private drug shops, called patent and proprietary vendors. However, few of the drug shop workers know how to appropriately manage the common childhood illnesses of malaria, diarrhea, and pneumonia. A quasi-experimental, controlled study was conducted in which more than 400 shops and 2,500 households were surveyed to test whether providing training and supervision to these community-based private providers could improve diagnosis and treatment of these common childhood illnesses on a population basis. At drug shops where staff received the training and supervision, appropriate diagnosis and treatment for malaria dramatically improved, from 16% to 88%. However, only 29% of the drug shops in the study areas received the interventions; the majority of drug shops were not registered with the local regulatory body and were excluded from participation. Due to the low coverage of the intervention, a population-level impact was not achieved. Expanding shop registration, along with training, could lead to improved intervention coverage and quality of care. The results and recommendations from the study are being used by Nigeria’s Federal Ministry of Health, the US President’s Malaria Initiative (PMI), and other implementing partners to guide the scaling of future training and supervision interventions for private drug shop owners. The project was funded by the US Agency for International Development and PMI. The project was implemented through a partnership that included MalariaCare (a global PMI-funded project led by PATH over the five years from 2012 to 2017) and the Expanded Social Marketing Project in Nigeria (led by Society for Family Health), in close collaboration with the Federal Ministry of Health, the National Malaria Elimination Programme, and the Ebonyi State Ministry of Health. The Society for Family Health/Expanded Social Marketing Project was responsible for implementation of the study; MalariaCare provided technical assistance and led the evaluation.